2017 may be an exciting year for SummersSpirit! Check back in March 2017 for puppies. For details go ​HERE. Our most recent litter is the Triple Crown racehorses! Born on August 16, 2016, you can see them HERE. Kohana's IM Aidan. Photo Christine Port. Velichestvo Katarina, ISWS FCH. Photo Emily Buerger. See them on Day One! Katarina is a petite powerhouse, with heart, athleticism, and lure drive that's second-to-none. Her stellar performance on the lure coursing field has already earned her several big wins, including Best of Breed at the 2010 Midwest Regional (the Ohio Classic) and 1st and 2nd placements on consecutive days at the 2011 ASFA International Invitational at Morven Park. Despite her diminutive size, she has shown impressive speed, consistently beating males that tower over her 19 3/4" height. Katarina's talent is not limited to performance, she is also major pointed toward her ISWS conformation championship from her Best in Show win at the 2011 Ohio Classic. After much careful consideration, we decided that the handsome Aidan was just the right guy to sire Katarina's first litter. Thank you to Chris Port of Kohana Silkens for making this litter possible! We are sure these kids will do their papa proud. This breeding brings together some of the most successful performance and conformation lines in the breed. 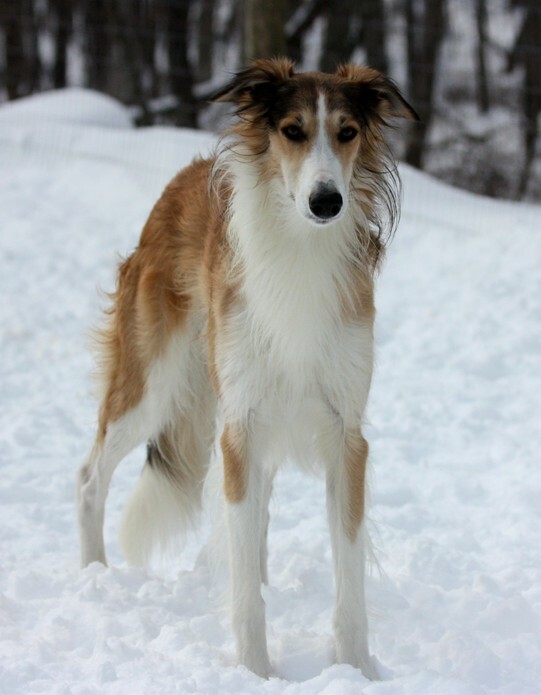 Katarina is the only daughter of the legendary Czar and Sasha, and her littermates have also been extremely successful on the show ring and in the field. Aidan's sire Tiki and grandsire Dante have good looks to spare, and Aidan's uncle River once rivaled Katarina's sire Czar for the title of fastest Silken in the country. Tiki's other littermates, including uncles Bourée and Chicory and aunt Danser, have also had significant success on the field and in the ring. 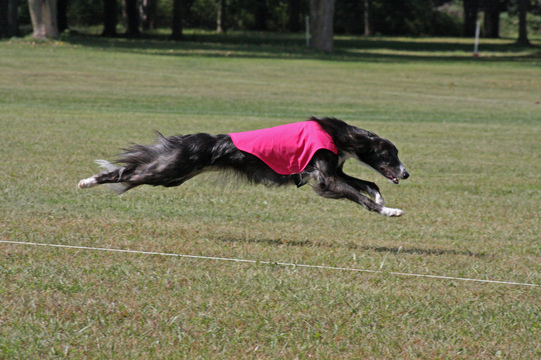 Aidan's dam line goes back to the most successful lure-coursing Borzoi kennel in the country. We are very excited about the promise that these pups hold! from Summer's Spirit, please contact us for our questionaire. Each home is carefully screened and references are checked before we consider a home for one of our dogs. All our litters are formally evaluated for conformation and temperament between 7 and 8 weeks of age. While we may have an idea which puppies are available before this, we will probably not be 100% sure until after both the formal evaluation and a temperament test. All puppies that are not show prospects are sold as companions with a spay/neuter contract.